Join Mercer Union for an intimate screening of films selected for their affinities to Geoffrey Farmer’s own practice as an artist. This rare presentation will include the projection of 16mm films by Bruce Conner, Arthur Lipsett and Stan Vanderbeek. Films include: Stan Vanderbeek Poemfield No. 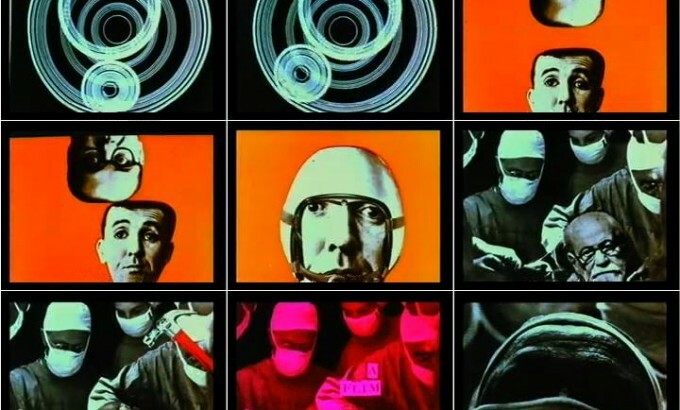 2 (1966), 16 mm, 5:40 min, colour, sound, Stan Vanderbeek Science Friction (1959), 16mm, 9:46 min, colour, sound, Arthur Lipsett 21-87 (1964), 16mm, 9:40 min b&w, sound, Arthur Lipsett Very Nice, Very Nice (1961), 16mm, 6:59 min b&w, sound, Bruce Conner Cosmic Ray (1961), 16mm, 5:00 min b&w, sound, Bruce Conner Cosmic Ray (1961), 16mm, 5:00 min b&w, sound, Bruce Conner A Movie (1958), 16mm, 5:00 min b&w, sound and Bruce Conner Cosmic Ray (1961), 16mm, 5:00 min b&w, sound. Full programme listing to be posted soon.